I’ve noticed that lately, there are a lot of people who are interested in fabric & silk painting. I do a considerable amount of fabric painting , especially silk painting in creating my art quilts. I’ve learned fabric painting pretty much by trial and error. And although I did have the advantage of being a watercolorist, that was different in many ways from painting on fabric. I’m going to share a few tips that I learned. I would say that I use Pueblo Seta transparent paints the most frequently. But I’ll mix and match brands as need be. As long as they’re acrylic paint made for fabric painting, you can mix them with other brands with no problems. Painting on fabric is similar to working with watercolors with one big exception. 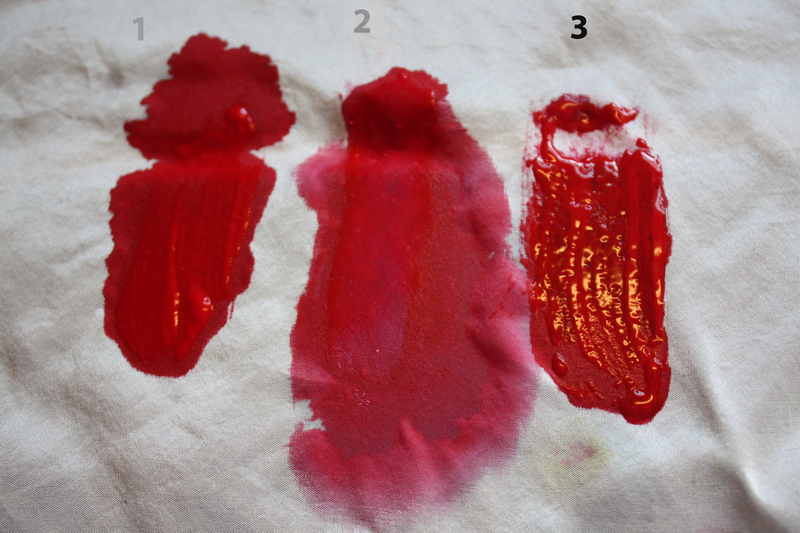 The paints will bleed onto the surrounding fabric, even when the fabric is dry. This can be controlled by applying lines of gutta resist to contain the paint in the one area. Call me lazy, but I don’t like the bother of that. I just want to paint. The color bleeding seems to be one of the biggest complaints for persons just starting out. So if you don’t want to apply gutta resists, what can you do? 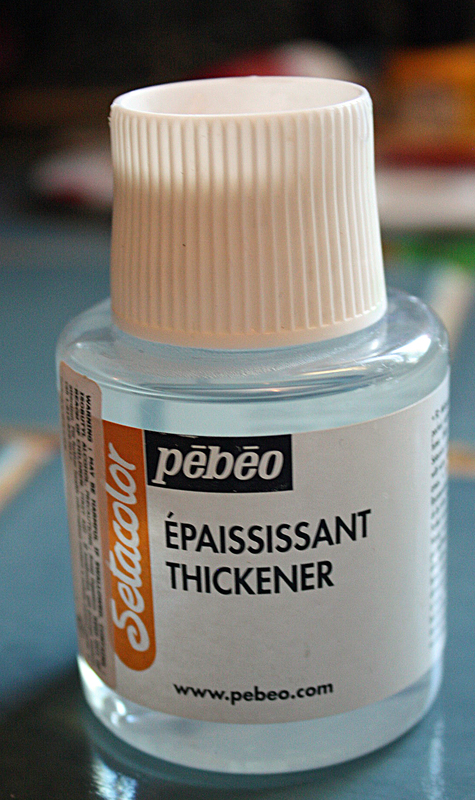 In a word Pebleo Setacolor Thickener! This is a wonderful product. When I want to do more precise painting, I thicken the paint with this product & it gives me more control. As the name implys, it thickens the paint and thickened paint does not bleed and run as much. If you want that watercolor effect with everything running and blending together, dilute the paint with water & apply to wet fabric.. You can spray more water to add effect and lean you board with the fabric attached to it to run the paints and blend in certain directions. Just experiment and have fun. Another option is to individually paint the important elements of your quilt design, let them dry and cut out the offending bleeding areas. Then use raw edge applique, to apply to the background fabric. It is fairly labor intensive for sure, but it does deal with the bleeding problem to some extent. I feel that it also makes a more interesting quilt. I use this method on many of my quilts, just because I like the way it looks. So try the Pebeo thickener and see what you think. I just read about a product that I can’t wait to try. It’s called Daler-Rowney FW Acrylic Water-Resistant Artists Ink. It is applied like fabric paint, but it doesn’t bleed into the surrounding dry fabric. Yet if applied to wet fabric it will blend, allowing shading and so forth. There are plenty of colors to choose from 38 in all. They are intermixable. I’m assuming the colors right out of the bottle will be very vibrant. If you want to create subtler colors and varying tones you can do so by diluting them. They can be diluted as much as you want, for lighter colors & a consistency more like a watercolor. 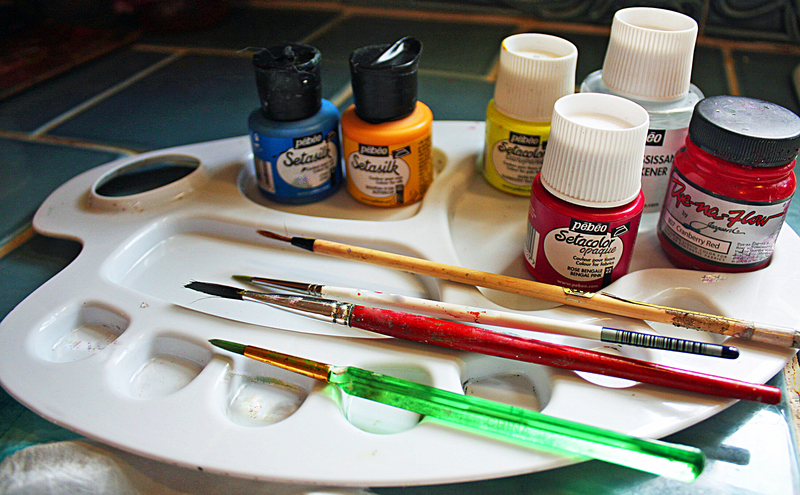 You can do washes with them as you would with watercolor, and add additional layers of color. You heat set with your iron. I’ve ordered some and can’t wait til they arrive. I’m itching to “play” with them, and see if they’re as good as they sound. I’ll let you know how they work out. Spell check, silk painting & applique.! I would like to have some fabric duplicated for sofa pillows. The fabric I like is a blouse by Linda Allard Ellen Tracy in 2005. Is it possible and do you know who could do it? It is a simple print like brush strokes on ivory in sage, rust and peach. I don’t know how exact it would be. I do fabric painting like so many others, but it would depend on the kind of fabric, design and many factors. It might be costly, but you could check online. Many sell handdyed fabrics you might find something simular. I agree with you that a lower heat setting on the iron will prevent damage to the silk, but then it won’t be as effective in setting the color. I use one of those applique iron sheets. It adds heat and allows you to keep the iron in the spot longer. It is recomnded to set for quite a long time. I also then use the dryer. Then finally, I hand wash with Retayne, it sets the colors. I think the Retayne is a really important step to set those colors. I do it in a sink and hot water and let it soak in there for a while. i have ben painting on silk and am working with maximum bleed on to wet silk. I like the results but Its the results after fixing with an iron that troubles me. I used a hot iron , maybe i should use a cotton setting ? and I washed the scarves on 30 Degree wash for 35 minutes. The definition of the forms has faded , so i am a little disappointed, do you think I should just use a gentle hand wash followed by a warm iron? They arrived, I was so excited! I’m still in the process of test driving them- to see what they’ve got. I’m having fun in the in the process, they go on really a lot like water color, so far great! I’ve used them on silk and they can make some interesting effects. They go on so nicely. I even mixed them with Seta paints and it worked out really good too. I’ll do a post in a few days,” but thumbs up with a snap ” so far.